When you select a Joomla template, many factors seem to influence your decision. Availability of features, mobile optimization, page load speed, SEO friendliness, customizability and cost involved play a crucial role in decision making. However, if you’re on a limited budget, you may want to use a free Joomla template for your website instead. If you’re also short of time, you want a ready yet brief resource to educate you on some of the best and free templates. Built on T3 framework’s latest version, Joomla magazine is a fully responsive template. It’s the latest template for Joomla 2.3 and Joomla 3 versions. Being light weight, it is perfect for news sites and magazines that intend to have tons of content online. The theme is highly customizable, supports multiple languages and comes with 10 bonus pages along with 5 color schemes. 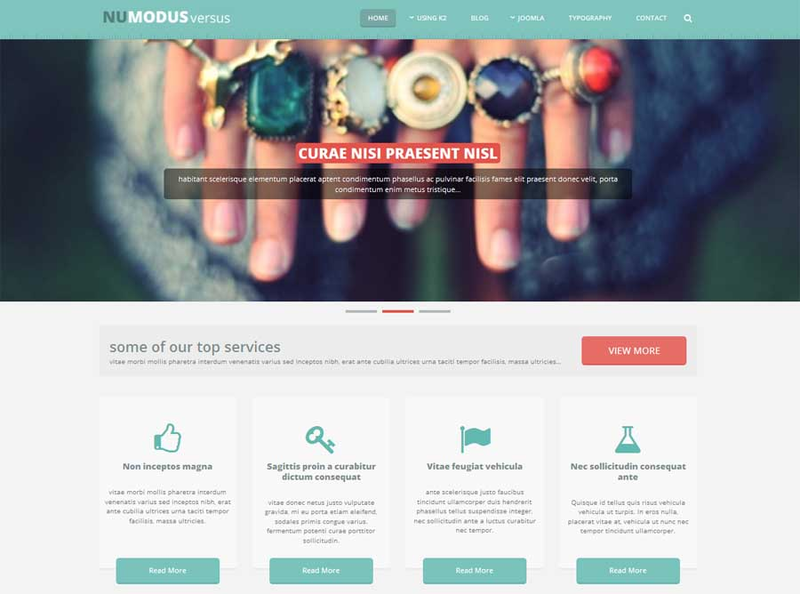 It’s a multi-purpose Joomla template ideal for all types of websites. 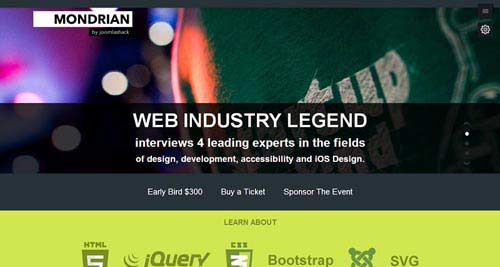 The theme offers a pack of icons, three color schemes, 350 + icons and numerous other great features including feature lists, client spotlight, blog section, screenshot showcase, slide shows and testimonial section. 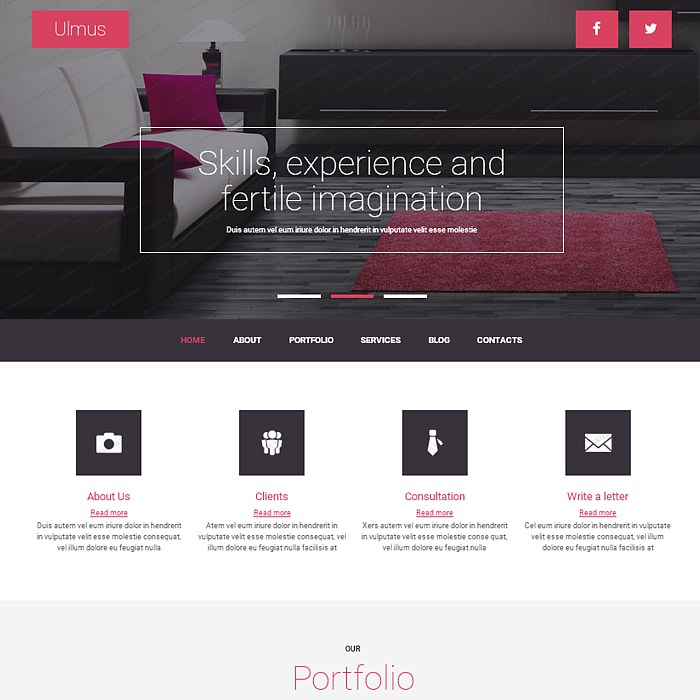 One of the best free Joomla template, Ulmus is 100% responsive and is compatible with Joomla 3.0.x – 3.0.x versions. It’s ideal for business, furniture and interior & exterior decoration websites. Ulmus is easy to customize, comes with advanced navigation, administration process and commenting systems including parallax effects. 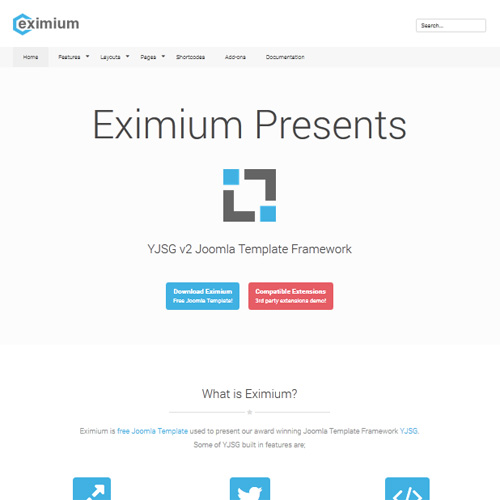 Eximium is based on YJSG v2 framework, which gives it a very appealing flat design, with in-built module tabs, module sliders and module accordions. In addition, you get the benefit from in-built advanced microdata settings to boost the ranking of your website on search engines. It comes with an extremely responsive design that adapts itself according to the screen size of the device on which website is accessed from. 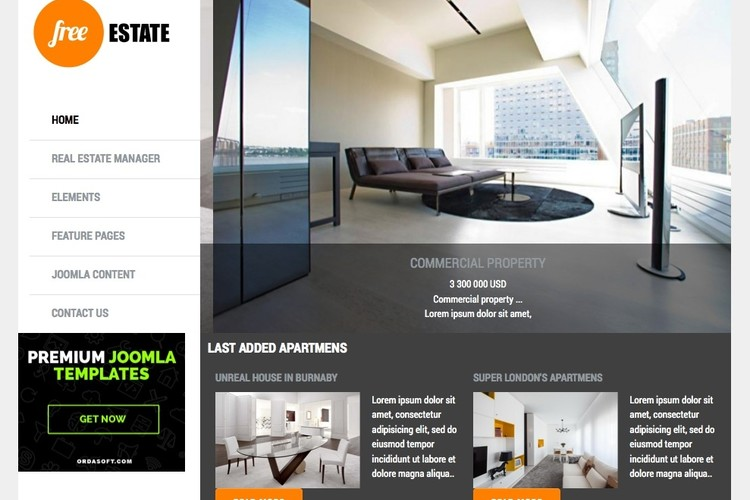 Free Estate is a simple, clean and sophisticated theme ideal for real estate companies. It comes with 100% responsive layout, free image slider, Google maps module, search module and dummy data. The theme has been designed for Joomla 3.3. The best part is that it comes with everything that you would require to set up a real estate website. If you’ve got a site in the latest Joomla version, Mondrian is probably the best choice. It uses colors tastefully and thus has an excellent appearance. The typography is very simple, but can be changed depending upon your preferences. It’s highly customizable and works well with Joomla version 2.5 and 3.3. It’s light weight, colorful and has tons of features. 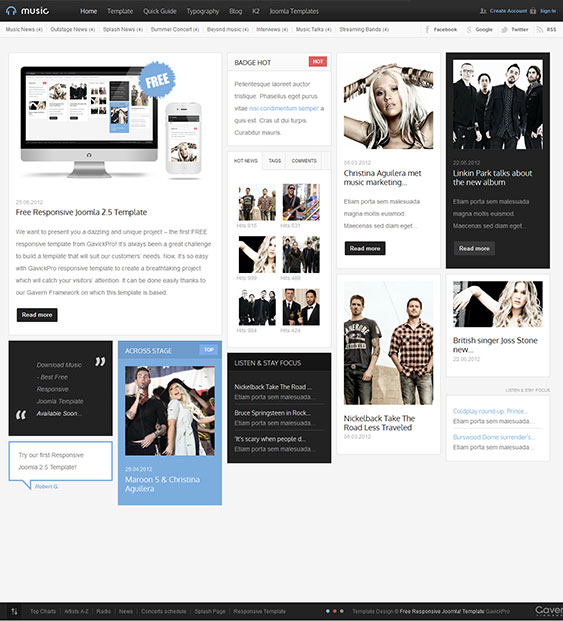 Music Free is a responsive theme that offers a tiled layout as shown above. As the name suggests, it’s an ideal Joomla theme for music-related websites or online portals. It effortlessly fits the size of the devices and maintains a great view. It’s a modern theme that has been designed keeping in mind the needs of musicians and music lovers. 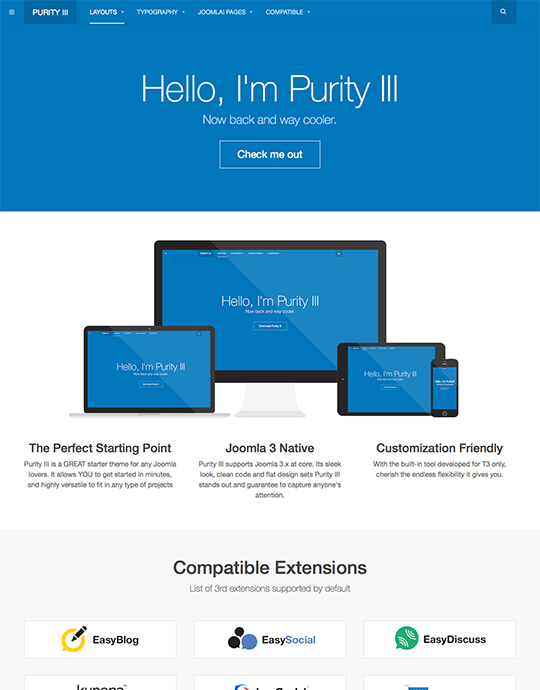 Purity III is considered as the best free and responsive template for Joomla 3. What makes it so popular is its versatility and multi-purposefulness. No matter what kind of Joomla project you have, it’s just the right theme. Built with T3 framework, it’s highly compatible with 3rd party plugins. Purity III is easily customizable and is available in German, French and Hungarian along with English language. The name in itself explains who this theme is for. If you are looking for an ideal Joomla theme to display your creativity, Creativia may be the right choice. The template is small, simple and clean and is compatible with Joomla 2.5 and 3. 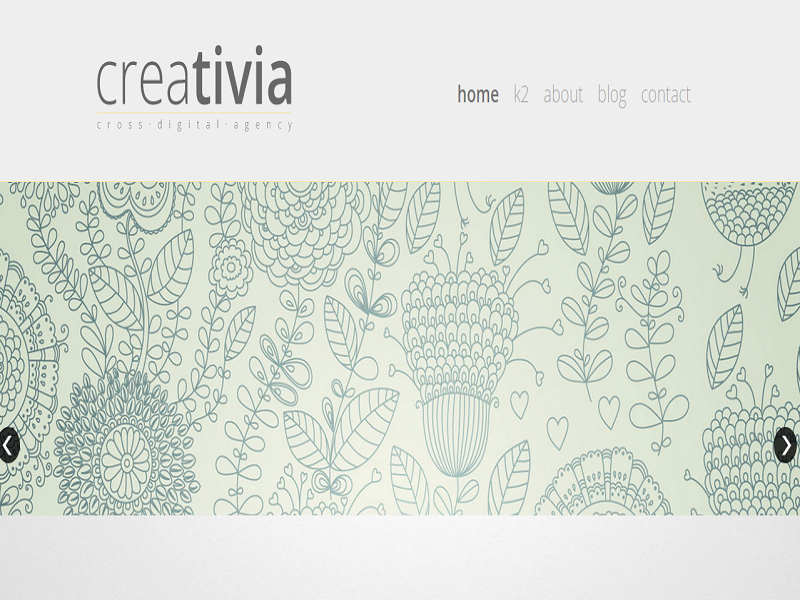 Creativia is suitable for blogs, creative portfolios or creative agencies. Named in the honor of Frank Lloyd Wright, a famous architect, Wright is a popular, light weight, minimalist, high speed and responsive Joomla template. It works well with Joomla 2.5. The theme focuses more on your images and content rather than its own aesthetics. While choosing from wide variety of Joomla templates available at the moment, we considered customizability, ease of integration, simplicity and responsiveness. So, try out the theme that you like the most and share your experience with us in the comments section.